Visit Waita Reservoir on Saturday afternoon, July 20 1:00pm to 4:00pm for a FREE keiki “catch and release” fishing experience, courtesy of Kauai ATV and Kauai Bass Fishing. Waita is Hawaii’s largest body of fresh water and is home to tilapia, big mouth bass and peacock bass. A rare opportunity to introduce this family activity of bygone years to your keiki. Reservations are required as space is limited. All keiki and family meet at Kauai ATV for check in and directions, located at 3477A Weliweli Road, Old Koloa Town. Bring your own equipment (bait and fishing poles). For reservations call the Kauai ATV office at 742-2734 or sign up online. Admission: FREE - bring your own equipment. 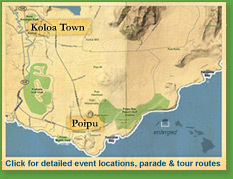 All keiki and family meet at Kauai ATV for check in and directions, located at 3477A Weliweli Road, Old Koloa Town.